Find romantic weekend getaway ideas in Pennsylvania. Special romantic getaways in Pennsylvania just for the two of you! One of America's Top Romantic Getaways! 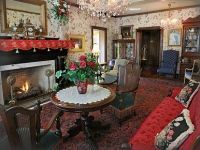 Listed as one of America's Top 10 Romantic Inns on the National Register of Historic Places, Buhl Mansion Guesthouse & Spa is perfect for romantic getaways in PA. Ascend the Grand Oak staircase to your luxurious guest room. All rooms contain individual heating and cooling, TV's, VCR's, DVD's, CD players, wi-fi, telephones, and either king- or queen-sized beds. The bathrooms contain Jacuzzis for two, separate showers, hairdryers, deluxe bathrobes, and slippers. At the spa, you get complimentary use of the steam room, sauna, and monsoon showers. Premium Pevonia Botanica products are used for all skin and body treatments. One of the Great Romantic Getaways in Central PA! 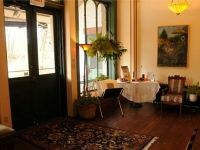 The Towers Victorian Inn is an authentic 1865 Civil War era mansion in the heart of Central PA. 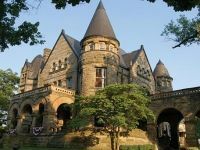 Romantic couples can marvel at the elegance of the mansion before taking in the sights of historic Ridgway, PA. Enjoy local activities such as elk-watching, canoeing, kayaking, hiking, biking, fly-fishing, and cross-country skiing. Also, the beautiful Allegheny National Forest is only minutes away! The six exquisite guest rooms are adorned with wallpapers and antiques from the Civil War era, and include private baths and A/C. A complete breakfast buffet, as well as complimentary beverages and snacks, are included with your stay. 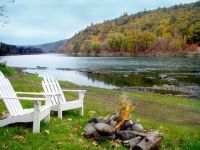 Romantic Pennsylvania Getaway right by the Delaware River! One of the Premium Romantic Getaways in Pennsylvania! 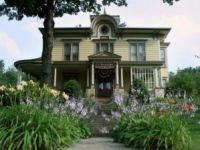 The Chelsea Sun Inn is a wonderful bed & breakfast in the heart of Pennsylvania, serving as the perfect romantic escape from the everyday grind. View the inn's beautiful farm and vineyard. Treat yourselves to in-room massages and classes on winemaking. The lovely list of local attractions includes the Delaware Water Gap, Big Pocono State Park, and Bushkill Fall Pocono Mountains. The lavishly designed country-style hotel rooms and suites are incredibly cozy. Sense an aura of calmness, relaxation, and romance like no other! The Inn is located merely 1.5 hours from New York City or Philadelphia and 2 hours from the New Jersey Shore. The Perfect Romantic Getaway in Brandywine Valley! Voted as one of the most romantic bed & breakfasts in North America, the Hamanassett B&B allows you to experience remarkable service and Southern hospitality in PA's Delaware County. This quiet, pleasant country home is only a 30-minute drive from Philadelphia and 20 minutes from Wilmington, DE. Enjoy lodging in a comfortable, home-like setting. The Hamanassett B&B contains four rooms on the second floor and three rooms on the second floor, each with a private bathroom. Complimenting the romantic setting, you're treated to a full breakfast served by candlelight in the dining room or on the outside terrace. One of the Best Romantic Trips in the Pocono Mountains! On the lookout for the best bed & breakfast in the Pocono Mountains? Book a room at the Roebling Inn on the Delaware. Splendid for a relaxing romantic weekend, the Roebling Inn is situated on a prime riverfront location. Kick back on the porch and indulge the beauty of the Delaware River Highlands. Enjoy the great outdoors by walking across the oldest suspension bridge in the country, fly-fishing, skiing, hiking Minisink Battleground Trails, horse-back riding, or golfing. The inn provides 5 guestrooms and a 1-bedroom cottage. Each room contains a private bath, TV with DVD, A/C, and wi-fi. A Lovely Country Romantic Getaway in PA! Woodward Crossings provides the finest in country vacation lodging. Nestled on 45 scenic acres, Woodward Crossings contains two luxurious suites that romantic couples are bound to adore. Each suite contains a fully equipped kitchen, fireplace, and living area, rewarding you with the comforts of home. Optional amenities include an Amish dinner and buggy ride, Amish baked goods basket, and a 1-hour full body massage. There are tons of local attractions 1 to 40 miles east of the lodge which include Woodward Cave, Penn's Cave, T&D Cats of the World, and Palmer Museum of Art. A Gorgeous, Old-Fashioned Romantic Getaway in PA! Inspired by the cinematic classic "Gone with the Wind," Tara is an illustrious country inn that offers the best in Pennsylvania romantic getaways. 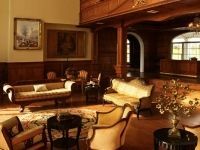 With a visit to Tara, you get to experience old Southern hospitality and the luxuries of the "golden days" in the present! Enjoy a delicious, multi-course gourmet meal in Ashley's Gourmet Dining Room. Take in the fascinating guided tour. Stay overnight at one of Tara's 27 magnificent guest rooms that feature gas fireplaces, whirlpools or sunken tubs, TV's, DVD players, plush robes, and other great amenities! The Most Romantic Getaway in Pennsylvania! Searching for an intimate couples resort in PA? At the Cove Haven Entertainment Resort, you and your significant other can enjoy a romantic dinner at the Colosseum Restaurant, sip cocktails at the Parrot Lookout Lounge, enjoy hors d'ouevres prior to a gourmet five-course dinner at Cupid's Corner, let loose at the Champagne Palace million-dollar nightclub, or engage in many other couple-friendly activities. To conclude your day of fun-filled romantic excitement, relax in one of Cove Haven's luxurious suites. When you take advantage of the all-inclusive honeymoon package, you also get free show tickets to some of the best concerts and comedians in the country! A 5-Star Romantic Getaway in Pennsylvania's Amish Country! A romantic getaway is not complete without a stay at the historic 5-star Cornwall Inn, located within Pennsylvania's scenic Amish country. At this secluded romantic destination, you can enjoy a wonderfully serene bed & breakfast stay. Book one of five individually and uniquely designed rooms and suites. Each room contains satellite TV, wi-fi, movies, and phones. All of the rooms have private baths and all but one room has a fireplace. The staff will guarantee a memorable experience, providing you and your significant other with the best in hospitality.